Developed for and used exclusively by Yosemite Mountain Guides, the Ultralight Pro kit is now available for retail sale. Ideal for any outfitter, guide, trip leader, or mountaineer who needs to travel light, fast, and watertight in the backcountry. Professional-grade components include a Laerdal® CPR Mask with O2 valve, SAM® Splint, and deep stock of bandages, dressings, and medications. 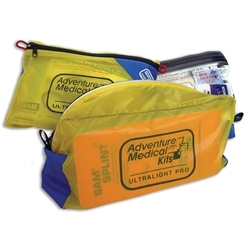 A pull-out Ultralight / Watertight .9 kit lets you keep weight to an absolute minimum on summit trips. Detachable Ultralight / Watertight bag for summit attempts or trips away from basecamp. Inner DryFlex™ bags keep contents dry in all conditions. Size: 10.25" x 7.5" x 5.5"